It’s also for my son’s friend Tessa, who loooves banana spring rolls – I make them for her each time she visits. Bon appetit, Heather and Tessa! I developed this recipe after we ate banana spring rolls at the now-defunct Red Door restaurant on South Granville Street in Vancouver. My son enjoyed them so much that I was inspired to try and recreate them at home. When cooked, the banana gains extra sweetness, making this a satisfying sugar-free treat. The spring rolls also make a crispy contrast to the fluffy, almost custardy texture of the cooked banana. Don’t fear the deep-fry – surprisingly, deep-frying at the correct temperature creates food that isn’t overly oily. Because spring roll wrappers are made of wheat flour, they aren’t Paleo, so I’d use this as part of a special-occasion cheat meal. This recipe serves 4 people (4 spring rolls each), but can easily be multiplied to serve a larger group. It’s a bit fiddly to make but oh, so worth it! As well, you can do a lot of it in advance if you like. 2 – 3 cups of oil for deep-frying. I use light olive oil. Put the frozen orange juice concentrate into a small saucepan and cook on low heat until thick, stirring occasionally. This should take about 15 minutes. Take it off the heat and let it cool while you make the spring rolls. Optional make-ahead tip: Put the sauce in the fridge or freezer when cool; thaw and gently warm before using. Cut each banana in half at its “waist” or equator, then cut each of the halves into 4 longish pieces about the size of your little finger. You should now have 16 pieces in total. Spread out a spring roll wrapper with one of the corners pointing towards you, as shown in the diagram below. Tip: Keep the other wrappers covered with plastic wrap or a damp cloth while you work — they dry out quickly. NOTE: The diagram below shows how to fold a spring roll wrapper with a *meat* filling – it was the best diagram I found, and far clearer than my own wonky photos. Your task, should you choose to accept it: Pretend the meat in the diagram is actually a piece of banana. Sprinkle the banana lightly with a tiny bit of the grated lemon peel. You just want a hint of lemon – the dominant flavour should be banana. Roll up firmly as shown below, pressing down the edges. Moisten the edges with extra water if needed to make them stick. 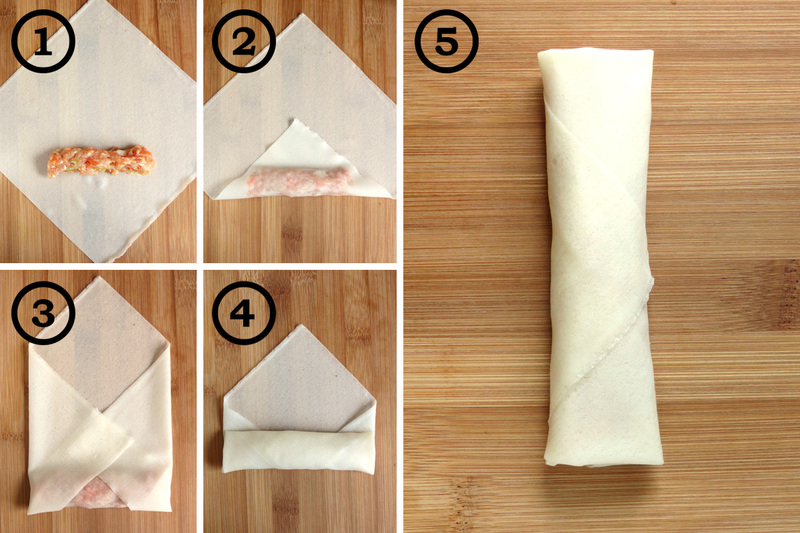 Repeat steps 2 through 6 until you’ve rolled all 16 spring rolls. Optional make-ahead tip: You could freeze the spring rolls at this point, then thaw and deep-fry them later. Heat the oil over medium-high heat until quite hot; 325 – 375 F is ideal (165 -190 C). You can test by putting a small test piece of spring-roll wrapper into the oil – it should sizzle and brown, but not burn. If the oil smokes at any time, it’s too hot. Keep the pot handle turned in, towards the centre of the stove, no nobody can bump it and toddlers can’t grab it. No trips to the emergency room! If using a tiny sauce dish, fill 1/2 the dish with the thickened orange juice and 1/2 with the whipping cream or thick coconut milk. Take a toothpick and make swirly patterns along the line where the 2 sauces meet — funnnn! If not using tiny sauce dishes, pool or dribble the sauce decoratively around on a small plate — see some creative ideas here. Receive accolades from happy guests! Looks yummy I will certainly try it! I do grow mint in pots in summer and a strawberry garden too! Can’t wait! Wow, your garden sounds beautiful, Heather! Having your own mint and strawberries will make it so much more special. I keep meaning to learn how to garden but haven’t got there yet…maybe when I retire 🙂 .